Today, my judment came. I would be 13 600 kronor, which is about $2000 in fines. I only were convicted for 2 of the 5 point I was accused on. Crime against the radiation saftey law and illegal environmental activities. I was acquited from another point for crime against the radiation saftey law, illegal possesioning with chemical weapons and crime against the law about warmaterials. In the 17'th of june I was in the court for my activities. The prosecutor wanted prison, but I'm almost sure that it would be conditionally and fines. My lawyer have done an extremley good job. I was a little bit worried to be judged to do more forensic-psychiatry investigations. But the court said no to that. The judgment will come on july the 1, 11:00 AM. Then after publishing the judgment, this blog will turn in on another way. I am going to post my paintings instead of nuclear- and poison-informations. 140521 - I am called to do a "forensic-psychiatric investigation". Today a letter came from the correctional. The court has decided that I should implement a forensic-psychiatric investigation (I used Google translate, I don't know what it really calls). The june 2'th I'm going to Halmstad for an investigation. I know there is something wrong with me, otherwise, I had not needed the 5 psychiatric pharmaceuticals that I take in high doses every day. I only know that I feel very bad if I quit with some of them. But I really don't know for what diagnosis... I have had about 30 diagnosis from when I was 16 years old, until now, I'm 34 on friday. I'm thinking if I shouldn't take my medicines before the investigation, or they want me investigated as it is now, I'm feeling pretty good with my medicines? If I stop with my Haloperidol, I'm being very bad. For example confused, paranoid, some times I've been hearing voices and another of cuckoos... The Haloperidol is a really good pharmaceutical, I couln't live without it. 140519 - Is it possible to build a nuclear bomb from smoke-detectors? Many have asked me if it is possible to build a nuclear bomb from smoke-detectors. Some media exaggerates my whole thing, and wrote "He was trying to building an atomic bomb from smoke-detectors"! But the answer is, Yes! It is possible. But you will need about 323 076 920 377 smoke-detektors if I had calculated it right. A smoke-detektor contains about 0,26 µg Americium-241. And the critical mass for Am-241 is about 84 kilograms. This is the bare critical mass. Then it could be reduced to about "only" 23 kilograms, with some reflection shields and so. So, start collecting! Over 323 billions of smoke-detectors! It is also possible to build a nuclear bomb from the far more expensive Californium. 1998 was the price $56 per microgram of Californium-252. The critical mass for Cf-252 is 2,73 kilograms, then a critical mass would cost about $153 billions. 140509 - Another pre-trial against me canceled! A pre-trial investigation on me has been canceled. It is the point; "Planing of murder" that has been canceled! There are no evidence of it! And of course I didn't plan to murder someone. I was just angry and drunk and wrote some threats on the Internet. One of the charges against me has been canceled! I was accused to have ordered merchandises to another person. Of course I don't do something like that. But it has maybe been a friend of mine, who promised to "make a hell" for the person I dislike. I don't know who. But the text I had sent out was stored in my computer. So the police adopted that it was me. One (or several) cobalt bomb(s) is a possible doomsday-weapon. Its an ordinary nuclear weapon, with a admixture of Cobalt-59. Co-59 is not radioactive itself, but the nuclear device sends out a lot of neutrons wich is absorbed by the Cobalt, and turn it into Co-60 wich is very radioactive. It has a half-life of 5,7 years. The radioactive Cobalt-60 can be spread over large areas and contaminate the surrounding things, plants, humans and animals. As little as 1 gram Co-60 can contaminate one squarekilometer, so it will be uninhabetable. The Cobalt will waporize in a nuclear explosion, then condense to solid form, in form of dust. "Dr. Strangelove or: How I Learned to Stop Worrying and Love the Bomb", the other is "On the Beach". It's also named in the James Bond-movie Goldfinger, where the bad guy has plans a little, but dirty bomb in Fort Knox to contaminate the Gold, with "Cobalt and Iodine". Newly manufactured Co-60 has an activity at 10 Sv at a hypotetical detonation fallout. Lethal dose is in 30 minutes is about 5 Sv. It takes 142 years (27 half-lives) to the Cobalt (wich has decade to Nickel) to be safe. There is no evidence that a country has manufactured cobalt bombs. 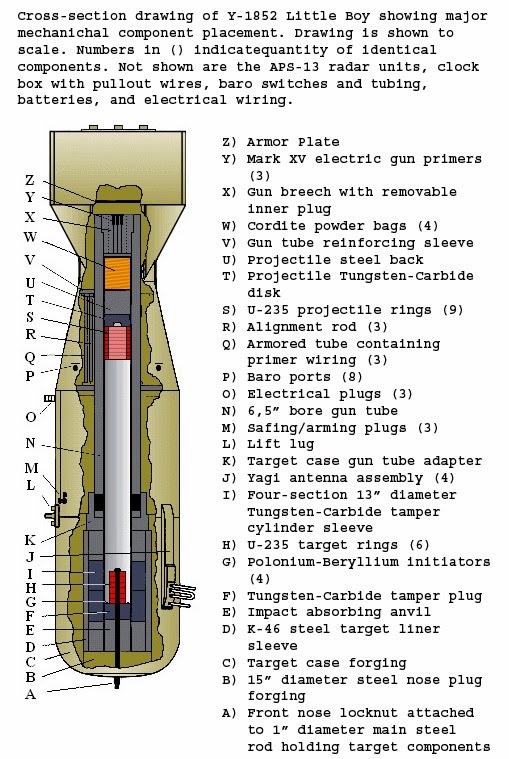 In a hypotetical bomb, for examle, the tamper can be made of Co-59. 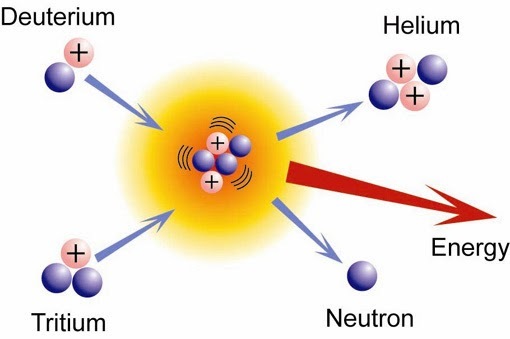 A thermonuclear bomb is based on fusion of atoms. Light atoms is smashed together. The most common is Deuterium (heavy hydrogen) and Tritium (radioactive hydrogen). When they are fusioned it realese a massive energy. To start the fusion, it requires a lot of energy. 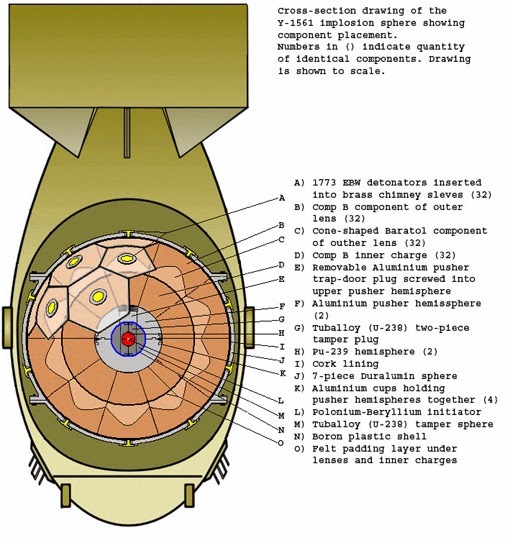 A fission bomb is used as a "detonater". Here is a simple drawing of a fusion bomb. The upper part is the fission-device, which triggs the fusion-part. Theoretical a thermonuclear bomb can be as big as preferably. A common warhead is W88, used in the SLBM (Submarine Launched Ballistic Missile). It has a yield around 475 kt. The biggest bomb ever detonated is "Tsar Bomba", which yield was about 50 Mt. Is was tested by the Soviet Union 1961. The biggest bomb tested by USA was Castle Bravo with a yield of 15 Mt. Se more att wikipedia; http://en.wikipedia.org/wiki/Nuclear_weapon_yield The "Tsar Bomba" was first designed to be 100 Mt, if the outer shell was made of Uraniun, so it would be as fission-fusion-fission. But that had causted a large amount of radioactive fallout. So the shell was made of Lead. 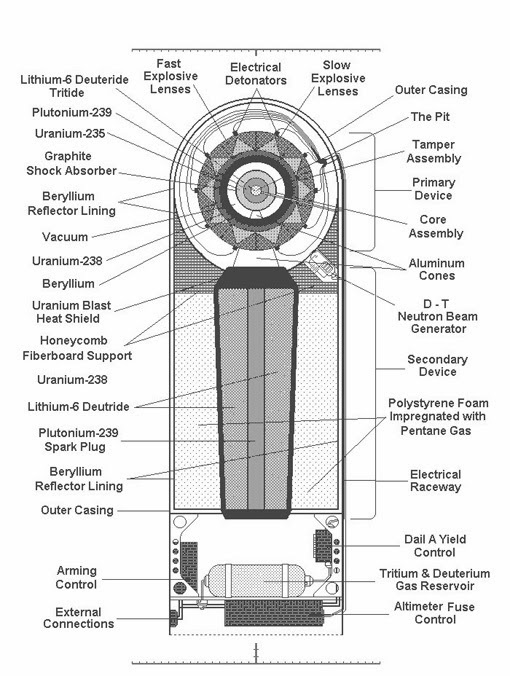 Nuclear fission bombs are based on Uranium-235 or Plutonium-239. At least one test has also been tested with Uranium-233. It is also possible to build nuclear bombs with Neptunium or Americium. It is a pretty simply comstruction. But the types are different depending on using U-235 or Pu-239. A U-235 is the easiest to build. Lets start with the U-235 device. You will need about 60 kg of almost pure U-235 (over 90 %). Natural Uranium consists of only about 0,72 % U-235, the rests is U-238, wich not is fissionable. Here is a drawing of the Uranium bomb "Little Boy" which was dropped on Hiroshima. 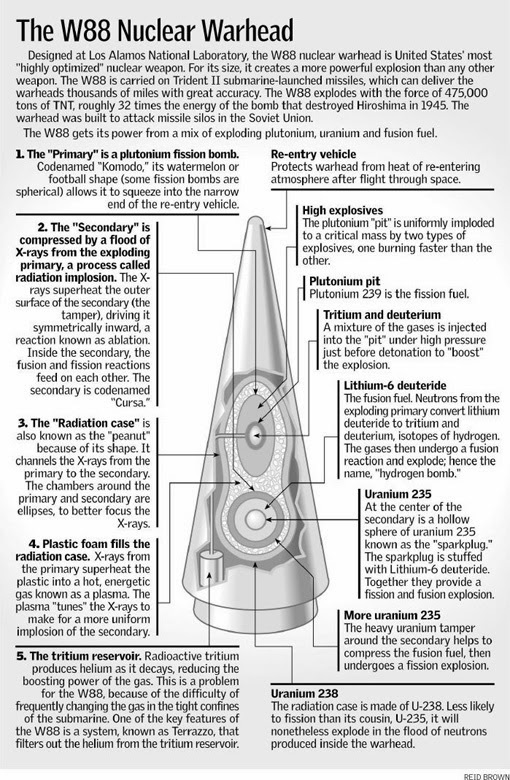 A Plutonium bomb is more complicated, it is built on a implosion of a Plutonium-sphere. But you will only be need of about 6 kg of Plutonium. Plutonium does not exist in the natur (exept for small traces), so it must be made in a reactor. The Plutonium is often alloyed with about 3 % Gallium. 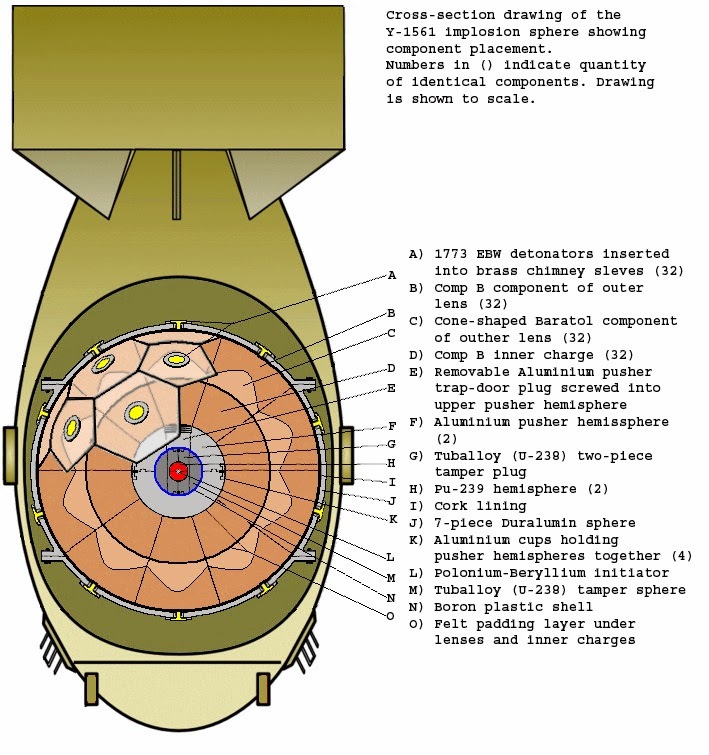 Here is a drawing of the Plutonium bomb "Fat Man" which was dropped on Nagasaki. The hard thing with this device is to get the explosive lenses to detonate exactly at the same time. In both cases, the device is build to smash together a fissile material into a critical mass, with help of conventional explosives. Little Boy had a yield of about 15 kt, and Fat Man about 21 kt.